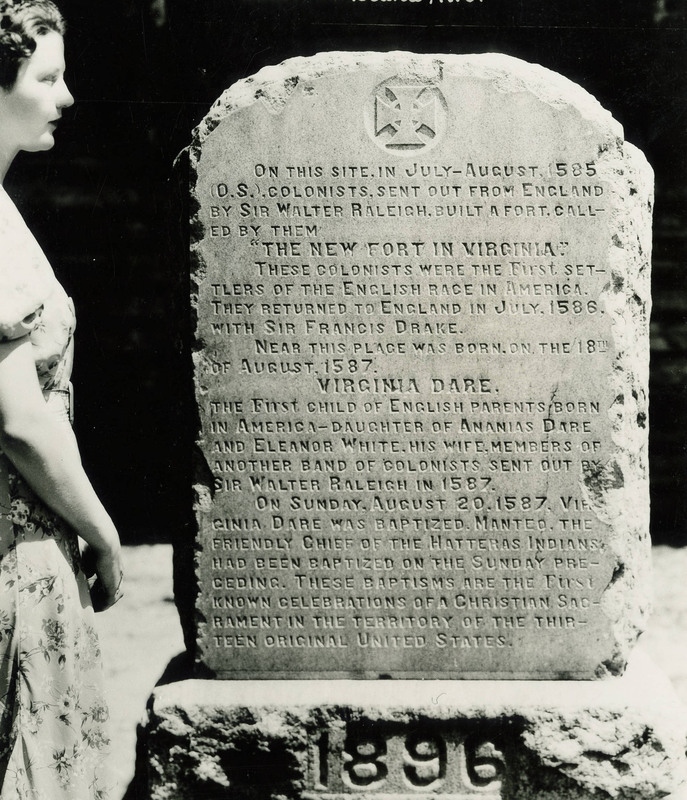 Source: Virginia Dare Marker, Fort Raleigh, Roanoke Island, N.C. This stone marker commemorates Virginia Dare and the members of the Fort Raleigh "Lost Colony." Standing approximately four feet tall, it is composed of a block of granite with rough cut straight sides and arced top and is inscribed on the smooth front and rear faces. A "cross pattee", also called an iron cross, is engraved above the inscription. The monument rests on two stone steps, with the one directly beneath the marker inscribed with "1896", the year of the commemoration. Front, monument: ON THIS SITE, IN JULY – AUGUST, 1585 / (O.S. ), COLONISTS, SENT OUT FROM ENGLAND / BY SIR WALTER RALEIGH, BUILT A FORT, CALL- / ED BY THEM / “THE NEW FORT IN VIRGINIA” / THESE COLONISTS WERE THE FIRST SET- / TLERS OF THE ENGLISH RACE IN AMERICA. / THEY RETURNED TO ENGLAND IN JULY, 1586, / WITH SIR FRANCIS DRAKE. / NEAR THIS PLACE WAS BORN, ON THE 18TH OF AUGUST, 1587. / VIRGINIA DARE. / THE FIRST CHILD OF ENGLISH PARENTS BORN / IN AMERICA – DAUGHTER OF ANANIAS DARE / AND ELEANOR WHITE, HIS WIFE, MEMBERS OF / ANOTHER BAND OF COLONISTS SENT OUT BY / SIR WALTER RALEIGH IN 1587. / ON SUNDAY, AUGUST 20, 1587, / VIRGINIA DARE WAS BAPTIZED. MANTEO, THE / FRIENDLY CHIEF OF THE HATTERAS INDIANS / HAD BEEN BAPTIZED ON THE SUNDAY PRE- / CEDING. THESE BAPTISMS ARE THE FIRST / KNOWN CELEBRATIONS OF A CHRISTIAN SAC- / RAMENT IN THE TERRITORY OF THE THIR- / TEEN ORIGINAL UNITED STATES. Rear: IN MEMORY, TOO, OF OUR FOUNDER AND FIRST PRESIDENT, EDWARD GRAHAM DAVES. / ERECTED BY THE ROANOKE COLONY MEMORIAL ASSOC’N, NOV. 24, 1896. / GRAHAM DAVES, / PRESIDENT / JOHN S. BASSETT, SEC’TY & TREAS. The marker may also be known as "The Lost Colony Marker." The National Park Service has referenced it as both "The Virginia Dare Monument" and as "The Raleigh Colony/Virginia Dare Monument." In 1894, the Roanoke Colony Memorial Association acquired the land where the historic site is now located with the intention of commemorating the Raleigh colony. In 1896 the monument was placed on the grounds. Plans were created to develop the site, and in 1932 the site was was turned over to the North Carolina Historical Association, becoming a state historical site in 1935. Federal funds assisted in the development of the site, and performance of Paul Green's play The Lost Colony began on the grounds in 1937. The National Park Service acquired Fort Raleigh in 1939, and it became a National Historic Site in 1941. The Roanoke Voyages of 1584 and 1587 were the result of Sir Walter Raleigh's attempts to found a British settlement in North America under Queen Elizabeth's grant of what became the Virginia colony. In 1587, under the leadership of the settlement's governor, John White, colonists sailed from England and took up settlement on Roanoke Island. Virginia Dare, his granddaughter, is considered the first child born at the colony in 1587. White returned to England for provisions only to discover the disappearance of the colonists when he arrived back at Roanoke Island in 1590. The mystery of the disappearance has earned the settlement the name of "The Lost Colony." The Roanoke Voyages Monument marking the voyages of 1584 and 1587 is located on Queen Elizabeth Street in Manteo next to the waterfront. The monument is located on the grounds of the Fort Raleigh National Historic Site on Roanoke Island, just north of the Visitor Center. It can be found along the walkway leading from the visitor center to the fort. The monument is located next to a pedestrian path in a woodland walk leading to the fort. From its first location on the grounds, the monument was subsequently relocated twice: once in the mid-1930s and sometime around 1950.